Want to buy the Carex Health Brands Day-Light Classic Plus? The Carex Health Brands Day Light Classic Plus Bright Light Therapy Lamp sets itself apart from most SAD Lights as it provides light from above, shining down onto your eyes – the perfect way to receive light therapy. If you decide you want to get the Carex Day-Light Classic, see where you can get the best price. The Carex Health Brands Day-Light Classic has adjustable legs so you can adjust the height of the device to suit your needs. The height can be altered so it stands anywhere from 25 inches high to 28 inches high – this is measuring the height from the base of the light to the top of the lightbox. The light box can be tilted up to a maximum of 15 degrees to direct the light onto your face. So simply adjust the box so you are comfortable with it and the light is positioned correctly. To get the most out light therapy the light should enter your eyes from above so it falls on the receptors near the lower half of your retina. Your eyes should be about 12 inches from the centre of the light and you should aim for 20 to 30 minutes in front of the Carex Health Brands Day-Light Classic a day. This device has two power levels, the lowest (shown by two marks on the switch) is equivalent to 7,000 lux and is intended for more task based activity such as sewing, reading, etc, the highest (three marks) is for light therapy. It uses three 36-watt compact fluorescent bulbs. The bulbs are rated for around 8,000 hours but they do lose lux with age and it is recommended they are replaced every two years regardless of whether they burn out or not. Replacements cost $18.95. 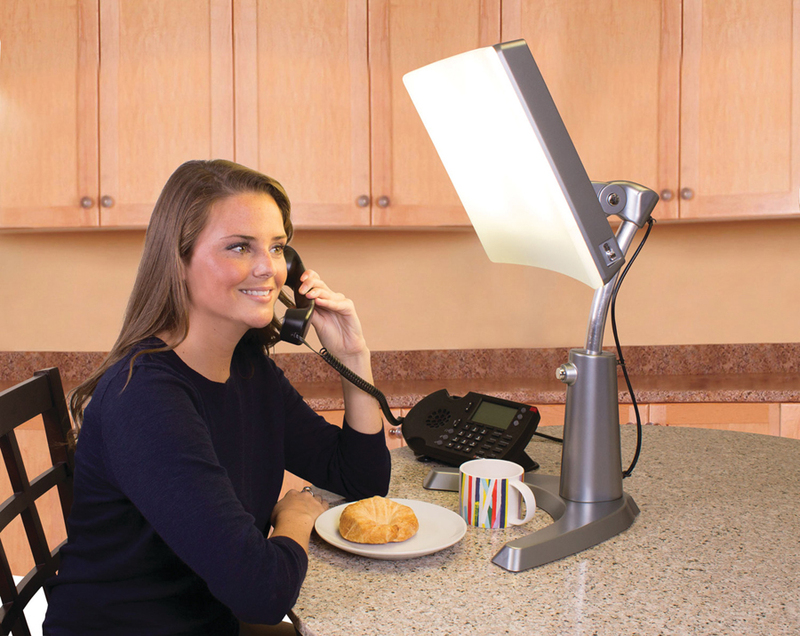 One of the main plus points this SAD light has above many of its competitors is, due to its design, it is really effective in making sure the light hits your eyes correctly so you can get the most from your light therapy session. As mentioned above the special light receptors in your eye are mostly found in the top half of your visual field. These receptors are designed to tell what time of day it is by noticing the brightness of the sky, which is (obviously) above the horizon, not below. Meaning light therapy is most effect from above. So whilst most other lightboxes sit on a table below your eye level, the Carex Day Light Classic can be position over whatever you are looking at and the light angled down towards your eyes in the most effective way. The size of the light itself, which measures 16” wide by 13” tall and 3” thick, means it cranks out a lot of light. No trying to direct a tiny block of light onto your eyes with this SAD light! This is great as it means you don’t have to keep your face in one direction, you can easily work on the computer, read a book, do whatever you want whilst easily getting your light therapy. 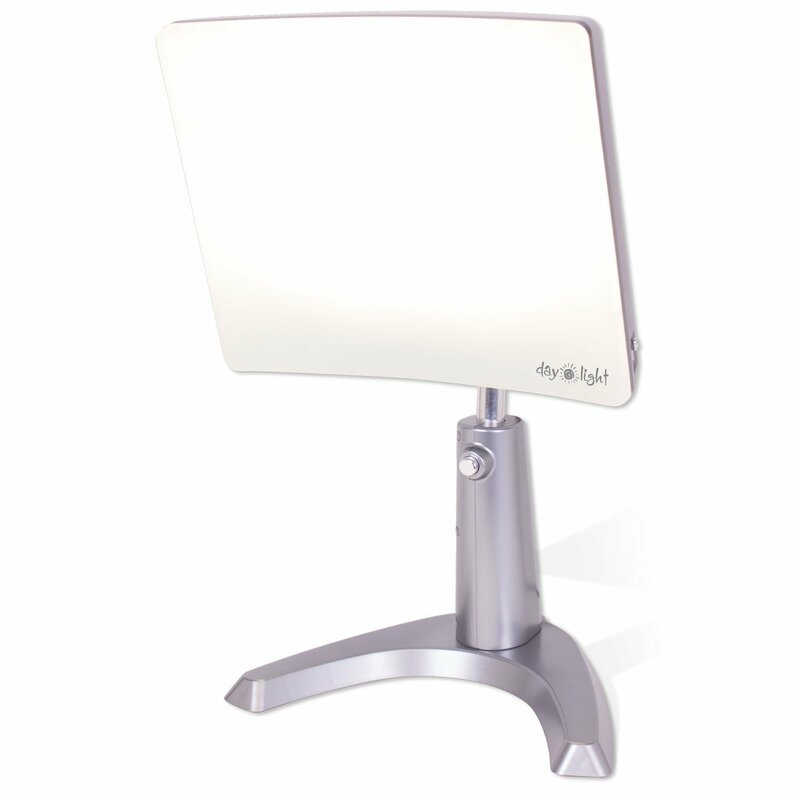 The light is easy on the eye and can be used for reading whilst you are taking in your light therapy. In fact aside from its use to combat Seasonal Affective Disorder it is actually an excellent lamp for general use. It can be used as a make-up/vanity light, whilst sketching or crafting or other detailed jobs. Carex have also truly thought of the user when designing this lamp. It is extremely versatile. Not only does it have the adjustable legs so you can alter the height of it, it also has a flip stand on the back you can use to prop it up by and a hole in the back so you can hang it on the wall. The light is also lightweight and easy to move around and it really does have some very positive feedback from those users who have bought it. 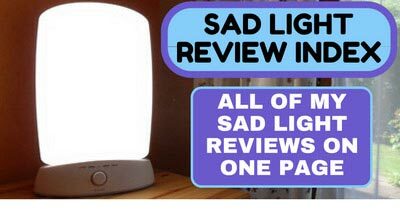 Every SAD light will have their advocates as for 8 out of 10 people light therapy works, but when it comes to the Carex Day-Light Classic its users are fervent in their support for the device – see our summary in the ‘And does it work section’ for more details. Of course the Day-Light Classic is not without its faults. One common complaint is that it emits a burning plastic smell when in use which can interrupt your light therapy sessions. If you encounter this problem it can be solved. When you first get the light, you need to remove the screws on the back (a tool is provided if you don’t have a long screwdriver) and open it up. You will notice little rubber bands around the metal clips near the top of the bulbs, for the time being take these off (they will go back on later) and remove the bulbs. You should now notice a little black rubber piece at the base where each bulb goes in to the light – these are what need to removed. Take them out using pliers and then replace the bulbs and the rubber bands that you took off and screw the light back on. Note the instructions provided also tell you all of this. Problem solved! There are also issues with assembling the item for the first time and then in the future replacing the bulbs. When replacing bulbs there are nine screws you need to undo, most of them awkwardly placed. It isn’t brain surgery, but it is annoying and the process more difficult than it needed to be, especially considering the manufacturer knows every user will most probably have to take it apart at some point to change the bulbs. The Day-Light Classics telescopic legs could also be better designed. They are quite wobbly and flimsy and you do need to be wary of bumping it as it could topple over. However as long as you are reasonably careful that shouldn’t be a problem. It also requires a fair amount of desk or table space to accommodate its design and footprint. Due to its size it is too bulky to travel with, so if you are looking for a portable light this isn’t going to be what you want. An alternative, that has a sturdier base and an equally large area of light is the Carex Health Brands Day-Light Sky. Someone described the Day-Light Classic to me once as the orthopaedic shoe of the light world! This might be apt, it is large and medical looking so it doesn’t win any awards on the design front unfortunately. It most certainly does! This has had masses of positive feedback. One user said it saved her marriage to her husband who suffers from SAD as they were on the brink of divorce due to the condition. Another claimed the lamp saved her life, career and relationship and even led her to consider that she could now have children. 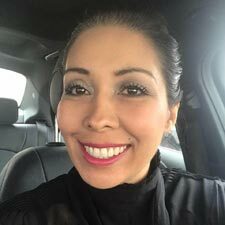 Plenty of others have said it has helped regulate their sleep cycle, improved their alertness, decreased their cravings for carbs, improved their mood and much much more. Lots and lots of positive feedback from users! The Carex Health Brands Day-Light Classic ticks pretty much all the boxes when it comes to choosing a SAD Light. The most important factor is that, unlike many SAD Lights, this can be easily set up so the light is shining from above down on to your eyes which is the most effective way to receive light. The light area is big, making it easy to do other things such as read or work on your laptop whilst you take in your dose of light therapy and is a really good general light as well. It loses marks slightly as it is a pain to replace the bulbs and the telescopic legs are slightly frail, but overall this is a great bit of kit and has some truly fantastic feedback from those who have bought it. There aren’t many superior SAD Lights to the Day-Light Classic, but you could possibly top it with the Verilux HappyLight Liberty 10,000 or the Carex Day-Light Sky. The Carex Day-Light Sky takes things one step further – it has the same huge field of light and provides light from above, but is amazingly adjustable and has a fantastic build quality – if you can afford it then this is the best lamp to get. The Verilux HappyLight Liberty 10k is reasonably priced and another top of the line SAD Light – with a lovely tone of light and a flexible design that can also be wall mounted. Hi, I am glad you have found the website illuminating (pun fully intended). 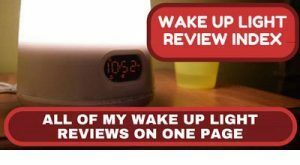 Wake Up Lights are purely to help you wake up in the morning, but SAD Lights have also been proven to help with both seasonal and non-seasonal depression – they really do make a difference. This is really cool. I didn’t even know that this kind of therapy existed. 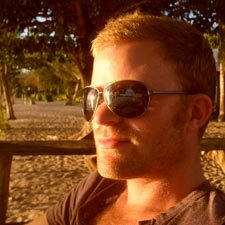 I was very interested in understanding the benefits – and you mentioned less cravings for carbs, and better sleep cycle, which makes me really want to explore this more. I’m actually very obsessive when it comes to lighting in general, because I think that certain lights really affect my mood differently than other lights. So this is definitely something I am going to explore much more. Thank you for this info. Thanks Ivan – glad I could ‘illuminate’ you! The Carex Day Light Classic is a great light and will definitely pick up your mood if you find yourself feeling a little down in the winter. Hope it helps you.